We train the best kids in Northern California! We’ve produced several State/National/International Champions! Whether your kid is a beginner or an advanced player, we can train your kid! CONGRATULATIONS to NORCAL kids for winning 3 major divisions at the SUPER STATE CHAMPIONSHIPS last March 11 & 12, 2017 at the Santa Clara Convention Center. NORCAL kids won the Team Championships for the K-6 Varsity, K-5 Varsity and the Kindergarten section!!! KUDOS to NORCAL HOUSE OF CHESS students who dominated the recently-concluded National Junior Congress last January 21 & 22 in Livermore. In the team competition, we won 4 National Championship Team Titles (4 out of 6 sections that we participated in!). Mihir Kinjawadekar, Mateusz Zielinski, Atul T.
Ujan Ray, Samik P. Ashley P., Saativk K.
CONGRATULATIONS TO ALL OF YOU! AWESOME JOB! Kudos to Katherine Pask for winning the CalChess Girls Age Level State Championship (10 year old section)! A special SHOUT OUT to ASHLEY PANG who tied for 1st place and earned a title Woman Candidate Master at the North American Youth Chess Championships (NAYCC) in Windsor, Canada! Congratulations to our very own, NHC home-grown student, Woman International Master Ashritha Eswaran who had an impressive performance at the recently concluded US Womens Championship that was held in St. Louis, Missouri. She scored a remarkable 5.5 points (highest among the superstar youngsters) drawing against GM Irina Krush (7-time US Women&#39;s Champion) and winning a crucial game in the last round against the tournament leader, WGM Tatev Abrahamyan. Despite being the lowest-rated in the tournament amongst the best female players in the country, she got 7th place and won $5,000! Kudos Ashritha! We are so proud of you! WIM Ashritha Eswaran tied for 3rd place (4th in tie-break) at the Pan American Championship (u-20) in Colombia, June 2016. She defeated the tournament leader in the last round, finishing an impressive 6.0/9.0. YAY ASHRITHA!!! Congratulations to NorCal House of Chess student IM Vignesh Panchanatham for winning the K-12 National High School Championships in Atlanta. There were 6 of them who shared 1st but Vignesh got a better tie-break. Another former NHC student, IM Kesav Viswanadha, also tied for 1st place. Congrats to both of you!Kudos to Vignesh’s team, Harker School, for winning the team championship as well. Another former student, NM Michael Wang was also part of the team who participated. NorCal House of Chess tied for 2nd place. After tie-breaks the two teams who competed which composed of NHC coaches and students ended up in 3rd and 4th place! NorCal House of Chess team won the top Chess Club award! NorCal House of Chess would like to say “GREAT JOB!” to our very own NHC student/member, Pranav Sairam, for winning first place in the 8 & under section at the 2016 US National Junior Chess Congress! NorCal House of Chess also took home TWO 1st place team trophies in the 16 & under and 8 & under categories. Congratulations to all our members who participated this past weekend! Winners 3 National Team Championships at the 2015 US National Junior Congress. Produced 2 National Champions! NHC won 5 State Championships as a team & produced 7 individual State Champions! NHC student, National Master Ashritha Eswaran won the US Juniors Girls Championships in Tulsa, Oklahoma. She also won the Gold Medal and earned a Woman International Master title and a WGM norm in the Pan American Girls Championships held in San Salvador, El Salvador. NHC student, Woman Candidate Master Aksithi Eswaran won the Gold Medal for Team USA at the Pan American Youth in Cali, Columbia.NM Ashritha Eswaran tied for 1st and took home the Bronze Medal on tiebreaks. Another NHC student, Chenyi Zhao tied for 2nd place and also took home the Bronze Medal. NHC Students Rishith Susarla and David Pan were part of their school team (MSJE) who competed at the Yes2Chess Grand Finals in London. Their team won 1st place. Coach Ted Castro came home with 2nd place in the U2200 and a cash prize at the Millionaire Chess Tournament in Vegas, Nevada. NHC students participated at the World Youth Chess Championships in Thessaloniki, Greece! CONGRATS to NorCal House of Chess Kids for winning 1st place (5th graders) at the State Championships! CONGRATULATIONS NHC FOR WINNING THE 2015 CHESS CLUB OF THE YEAR FROM USCF !!! 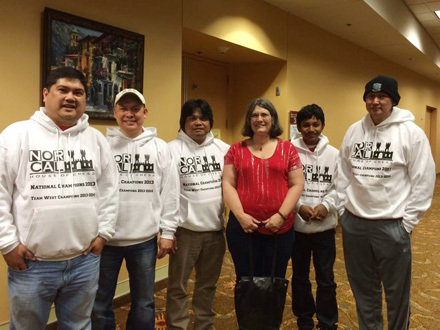 United States Chess Federation (USCF) has selected NorCal House of Chess as 2015 Chess Club of the Year. We are honored to receive such esteemed recognition. We would like to give thanks to all our loyal members, great coaches, wonderful parents, awesome students and everyone who has been part of NorCal House of Chess in one way or another. We share this award to all of you. NorCal House of Chess did it again! They beat Pinoy Revamp (USATN Champions) in the playoffs (3-1) to face EAST in the Finals. They beat Virgnia Assassins in the finals with a score of 35.-0.5. NorCal House of Chess Team is composed of coaches & one student. They just made history by winning 3-years in a row! Kudos to NorCal House of Chess Team! Congratulations to WFM Joanna Liu for winning the Gold Medal at the NAYCC in the Girls u14. She also earned a Woman Fide Master Title! B. U.S. GIRLS JUNIOR CHAMPIONSHIP IN TULSA, OKLAHOMA. Congratulations to National Master Ashritha Eswaran for winning the US Girl’s Junior Championship which was comprised with some of the girls in the country. She was the lowest rated in the competition and still came out on top. With the win, she gets a seat at the US Women’s Championship in St. Louis next year and also represent US for the World’s Junior Girl Championship in Russia. Amazing week for NorCal House of Chess students. These kids represented team USA at the Pan American Youth Championships in Cali, Colombia. WCM Aksithi Eswaran won the Gold Medal by winning all her games (9.0/9.0) in the Girls u10 secion. Her sister, NM Ashritha Eswaran, played 2 sections up, tied for 1st place and brought home the Bronze Medal. She also earned a WFM title and WIM norm, Lastly, Chenyi Zhao, playing in the Girls u12, tied for 2nd place and got the Bronze Medal. WIM Ashritha Eswaran scored 7.5 points to win the Pan American Championship Girls U20 in El Salvador. With the win, she earned an outright Woman International Master title and a Woman Grandmaster norm. This girl can’t seem to be stopped!